The Los Angeles (LA) River watershed covers an area of 854 square miles, originating in the Santa Monica, Santa Susana, and San Gabriel Mountains. The headwaters of the river are mainly open space, and the remaining 500 square miles are highly urbanized. The LA River watershed has been in drought. For nearly every year since 2011, rainfall amounts have been 5 to 9 inches below the 15-inch yearly average. Low rainfall is a significant factor in causing the drought; however, it is not the only reason. Increasingly warmer temperatures cause evaporation to be greater than precipitation, meaning California is losing more water than it is gaining. In addition, impervious surfaces prevent water from infiltrating into the ground and replenishing the river systems. Since channelization of the LA River was completed in 1960, the river has been primarily a concrete-lined flood control structure that receives water from run-off and point source discharges. 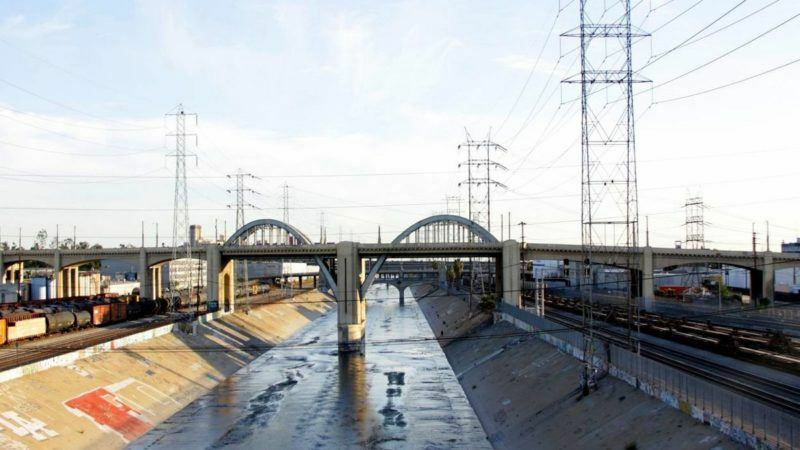 Any water flowing through the LA River is transported directly to the ocean, carrying pollutants with it. Because rain is intermittent and comes in large bursts, the first rain carries the highest concentration of built-up pollutants – like oil, nutrients, and heavy metals – to the river in what is referred to as the “first flush.” The Clean Water Act (CWA) creates water quality standards for national waterways; and while it permits point discharges to the LA River, illegal dumping and non-point discharges are not easily enforced. In spite of the challenges faced by this highly urbanized river, organizations in the LA region are creating pathways to improve water quality and put in place more effective policies by teaching high school students about water science and civic engagement. Funded by an EPA Urban Waters Small Grant, the Constitutional Rights Foundation (CRF) joined with UCLA’s Institute of Environment and Sustainability (IoES), and the LA Waterkeeper (LAW) to form a unique partnership between scientists, public policy professionals, and educators. Together, they created the Urban Waters Civic Action Project (UWCAP) to educate and empower high school students in highly industrialized urban areas in LA County. Beginning in January 2017, the UWCAP curriculum was implemented in four high schools in the LA area. The curriculum incorporates and fulfills topics from both Next Generation Science Standards and Common Core State Standards, providing high-quality science, technology, engineering and math (STEM) projects to high schools in underserved areas. The project brought students from highly urbanized communities in contact with natural resources in their neighborhoods. For some, it was the first time that they ever interacted with the LA River. Students learned that STEM education and civic action are distinguishing attributes of well-informed “eco-citizens.” Through classroom instruction, they garnered background information about pertinent water science; and, they studied their own watershed in relation to these topics. They also discovered environmental issues that are present in their communities: water shortages and poor water quality due to high concentrations of industrial pollutants. 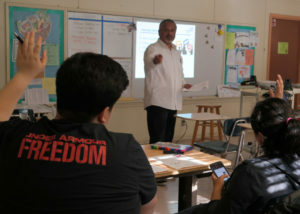 Unique to this curriculum, students engaged in learning about public policies pertaining to water resources. They were introduced to civil suit provisions that are written into the CWA, and other environmental regulations. Furthermore, they examined policies implemented in LA. Using analysis tools, they scrutinized both the advantages and disadvantages of different policies. The project went beyond the classroom, leading students to apply what they learned. As part of their civic engagement focus, they tested water quality in the LA River and collected data about trash and industrial stormwater pollution. This work formed the baseline for their projects and set the stage for their next steps: advocating for policy solutions. Culminating the curriculum, students presented their civic action projects at the UWCAP Showcase that took place in May 2017 at The California Endowment, an LA non-profit organization focused on building healthy communities. Nearly 200 students participated in the Showcase, presenting on topics ranging from littering, water quality impairments, and impervious surfaces, and offering policy solutions such as better access to trash receptacles, more reliable water quality testing and reporting, and increased green spaces. Delivering the keynote speech at the showcase, LA city attorney, Mike Feuer, expressed appreciation for the student-led civic engagement projects. In highly urbanized and industrialized areas, like LA, it is easy for citizens to feel disconnected from their water resources. 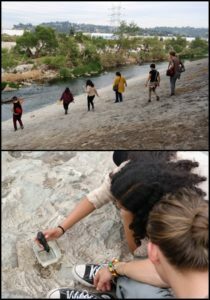 The UWCAP curriculum brings students in contact with the LA River through hands-on water science as well as analysis of public policies affecting it. Emphasizing the importance of STEM topics and public policy awareness, the UWCAP partners provided high school teachers with integral lessons that will continue to be taught to the next generation of advocates and decision-makers. In effect, the project successfully educates and creates “eco-citizens” who feel connected to their environment and are prepared to advance the protections of water resources in a meaningful way. Constitutional Rights Foundation (CRF) is a non-profit, non-partisan organization specializing in civic education for K-12 schools. Through CRF’s programs and curriculum, students gain the knowledge, skills, and dispositions of informed and engaged citizens who are able to identify and address issues that matter to them. Located in Los Angeles, CRF serves teachers and students across the nation.